Congratulations to all the individual award winners below and special congratulations to the Women's hockey team for being named the Leroy Washburn Community Service Award winners. * This is only the second time in 53 years that the Don Connolly Trophy has been shared. McGill Martlets, CIS Women's Hockey Champs! Congrats go out to the CIS National Women's Hockey Champs, the McGill Martlets. Both teams, McGill and Montreal played extremely well in the gold medal game. Both teams scored in the first period, McGill narrowly edged the Carabins in shots on goal 7-6. In the second period McGill was the only team to score, taking a 2-1 lead, McGill had lots more pressure on the Carabins goaltender, Elodie Rousseau-Sirois, with shots on goal 11-4. The third period is when the scoring opened up though, first with McGill taking a 3-1 lead midway through the period. Not to be outdone though, Montreal started their comeback. The Carabins scored under a minute later to make it a 3-2 game. With 3:13 remaining on the time clock Montreal was able to get the tying goal, making it whole new hockey game. This was the first period in which Montreal lead the shots on goal 11-7. The first sudden death overtime decided nothing. The four on four overtime was fast and exciting though with lots of close chances. McGill doubled the Carabins shots on goal 6-3 in the 10 minute frame. The second overtime was incredibly short, Montreal took a penalty late in the first overtime giving the Martlets a 4-3 opportunity at the beginning of the second overtime. It only took 0:37 to score the season ending goal. D-lady Brittney Fouracres had the final shot on goal for the season and it was worth all the marbles. In game number 8 of the CIS Women's Hockey Championships hosted by St. Thomas University, the University of Saskatchewan Huskies scored five powerplay goals en-route to a 6 to 3 win over the Wilfred Laurier Golden Hawks. U of Sask. defencewoman Julia Flinton scored a hat trick to pace the Huskies to their first CIS medal in school history. The score was tied after the first period at 1's, U of Sask held a 3 to 2 advantage after two, and pulled away in the third with three goals including an empty net tally. Congratulations to the University of Saskatchewan. Tonight's Gold Medal match up between the University of Montreal Carabins and the McGill University Marlets stands to be a dandy tilt. These two teams HATE each other and that word probably doesn't do this rivalry justice. It will be the ninth meeting of season this evening, both teams with 4 wins each. Number Nine will be for a National Championship. Come one, come all to the Grant-Harvey Centre tonight at 6:30 PM ADT for what should be a classic. Teah Anderson (Burns, Apperson), game tying goal. The lady Tommies faced off against the UdeM Aigles Bleues this morning at 10am to play the 5th place game. Although beat from playing the last two nights against Saskatchewan and Montreal. They gave the Tommies faithful one heck of a great game! The Tommies pressured the Aigles Bleues right till the very end of the game, you could certainly see it in the shot count. St. Thomas lead the shots on goal for a total of 28-21. Unfortunately Moncton led in the score column, as they beat the Tommies 2-1 in regulation. Moncton opened the scoring in the first period when they managed to get one past Tommies keeper Kristin Wolfe three quarters of the way through the opening frame, the shots on goal for both teams were nine a piece. The second period remained scoreless till Teah Anderson (Burns, Apperson) found the back of the net at the 18:19 mark. The Tommies kept putting shots on goal and trying to solve UdeM's Gabrielle Forget, St. Thomas led the shots on goal 10-4. The third period did not disappoint as the Tommies came out flying trying to get that all important go ahead goal bit to no avail. Moncton scored at 9:36. 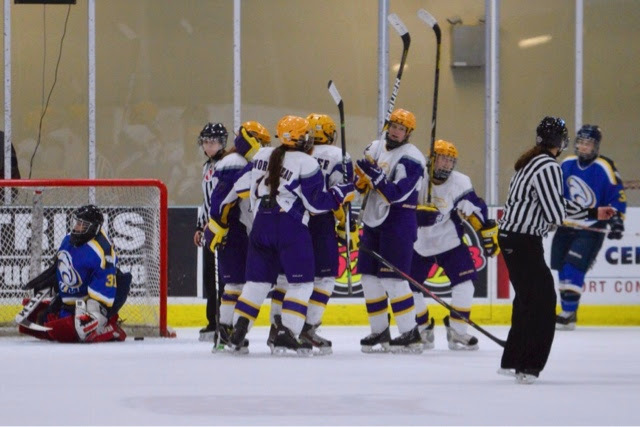 St. Thomas pulled goaltender Kristin Wolfe with 37 seconds left on the game clock but even with the extra attacker were not able to get the tying goal. The Tommies still came out on top of the shots on goal 9-8. Congratulations to captain Katie Brewster, Amanda Burns, Kristin Wolfe and Jordan Miller as they go off to graduate in April. You ladies left it all on the ice and the Tommies fans thank-you for all your hard work and dedication. This afternoon the Laurier Golden Hawks and Saskatchewan Huskies are going to play-off for the bronze medal at 2pm. Good luck to both teams. Tommies captain, Katie Brewster gets stopped on the re-direct. No, our Tommies didn't pull off an upset of the best team in the country tonight at the Grant-Harvey Centre but they never stopped trying, not even for a second. The Carabins scored one goal in each of the first two periods and two more in the third to defeat St. Thomas 4 to 0. We really can't say enough about our Tommies Fans tonight either. They were the 7th player on the ice and you could really see the players respond to the loud cheers they received for making great plays. Way to go!! Let's keep it up for one more game as our Tommies will play tomorrow morning at 10 AM versus our old provincial rival the U de M Aigles Bleues in the Consolation final. Also good luck to our Lady Tommies basketball team competing for Gold at the CCAA Nationals. Go Tommies Go. The Lady Tommies played their opening game of the CIS Women's Hockey Championships on Friday night at the Grant Harvey Centre in front of a sold out crowd of 1522 fans. The fans were treated to a great effort put forth by both teams. There was no scoring in the first period however the Tommies had lots of pressure on the Huskies goaltender. The Tommies had 11 shots on goal to Saskatchewan's 5. It was almost to the midway mark before the scoreless streak was broken for both teams, when the Huskies put the first goal on the board, not to be outdone the Tommies came right back less than a minute later and put one in for themselves off the stick of Emily Ryan (Steinert, McTaggart) to tie the game up. This was the first goal of the season for Ryan and it couldn't have come at a better time. The Tommies kept the pressure on the Huskies goaltender leading the shots on goal again by the end of the frame, 11-10. The Huskies came out in the third period though re-energized and ready to go keeping the Tommies in their own end. Saskatchewan scored two goals back to back a little over a minute apart, this did not hold the Tommies back though as Jenna Scott (Unassisted) scored with 15 seconds left in the game, the Tommies had a few close calls on the Huskies goaltender but were unable to find the back of the net. This was the first period where Saskatchewan lead the shots on goal 11-10. The Huskies won the game 3-2. All fans stayed on-hand and at the edge of their seat right to the very end. Cassidy Hendricks of Saskatchewan stopped 30 of 32 shots, while Kristin Wolfe turned away 23 of the 26 shots. Tomorrow afternoon at 2pm UdeM will face-off against the McGill Martlets while the Tommies are back in action at 7pm when they play the number one ranked Montreal Carabins. Come early if you want a seat as they will fill up quickly and don't leave your noise makers at home. Let's cheer the Green and Gold onto victory! The Laurier Golden Hawks had a big game against the Université de Moncton Aigles Bleues. Laurier scored within a minute of the first period and never looked back from that point on, adding five more goals after that, to make it a 6-0 win. Amanda Smith from Laurier was tough to solve, turning away all of Moncton's 22 shots on goal for the shut out. UdeM's goaltender Gabrielle Forget hung in there as she stopped 32 of 38 shots. There were two shots in the first and second period where the puck went the entire length of the goal line but never crossed into the net. UdeM will face McGill tomorrow afternoon at 2pm for game# 5 of the Scotiabank CIS Women's Hockey Championships. Tonight the STU Tommies will face-off against the Saskatchewan Huskies for a 7pm start At the Grant Harvey Centre. Come on out and make lots and show your Tommie Pride!! 24 shots for a shut out. Game two of the CIS Women's Hockey Championship was very similar to game 1, the RSEQ team was too much for the opposition, as the Montreal Carabins defeated the Saskatchewan Huskies 3 to 0. St. Thomas will now face the Huskies tomorrow night at 7PM in game four. Come out and support your Tommies. Game three tomorrow afternoon at 2PM will see AUS Champions U de M Aigles Bleues take on the OUA Champion Wilfred Laurier Golden Hawks. 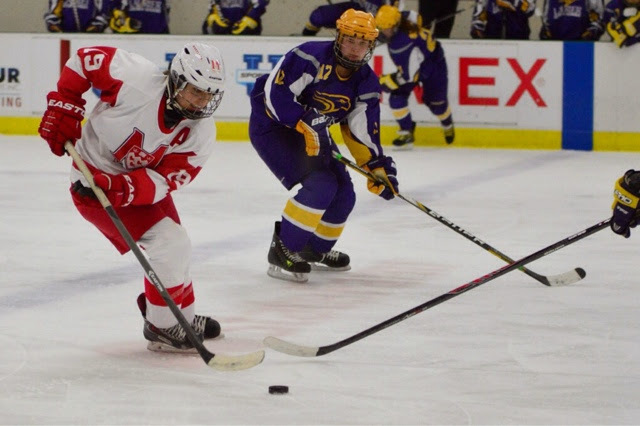 In game one of the CIS Women's Hockey Championships, the McGill Martlets faced off against the Wilfred Laurier Golden Hawks at the Grant Harvey Centre. McGill opened the scoring and we're able to get out to a 3-0 lead before the Golden Hawks put their first tally on the board midway through the third period. The Martlets were able to put the final insurance goal in though shortly afterwards, making it a 4-1 game. The Martlets started Taylor Hough in goal who was solid under pressure stopping 20 of 21 shots. The Golden Hawks started Amanda Smith who stopped 20 of 24 shots. The players of the game were Devon Skeats from Laurier and Gabrielle Davidson for McGill. Laurier will now play Universite De Moncton on Friday afternoon at 2pm to see if they can play their way into the semi-finals. Tonight the number four ranked Saskatchewan Huskies will face off against the number one ranked Carabins de l'Université de Montréal at 7pm, come early to catch the opening ceremonies to the tournament. OTTAWA (CIS) – The defending national champion University of Montreal Carabins have been established tournament favourites heading into the 2014 Scotiabank CIS women’s hockey championship in Fredericton. The seeding and pools were announced Sunday for the six-team competition, hosted for the first time by St. Thomas University. The tourney gets under way on Thursday at the Grant Harvey Centre and culminates next Sunday at 6:30 p.m. Atlantic Time with the gold-medal final, live on Sportsnet 360. All nine games from the championship will also be webcast live on www.CIS-SIC.tv. The Carabins, who a year ago captured their first CIS title in only their fourth season in the league, are seeded No. 1 for the second straight campaign. They will be joined at the event by the No. 2 Wilfrid Laurier Golden Hawks (OUA champs), No. 3 Moncton Aigles Bleues (AUS champs), No. 4 Saskatchewan Huskies (Canada West champs), No. 5 McGill Martlets (RSEQ finalists) and No. 6 St. Thomas Tommies (hosts). Reigning champion Montreal will compete in Pool A with Saskatchewan and St. Thomas in the round-robin portion of the competition. The Carabins open their title defence Thursday at 7 p.m. AT against the Huskies. The local favourite Tommies face the losers of that match-up on Friday and the winners on Saturday. In Pool B, Laurier and McGill square off in the tournament opener Thursday at 2 p.m. Moncton takes on the losers on Day 2 and the winners on Day 3. Montreal has been a remarkable story since joining the CIS women’s hockey circuit in 2009-2010, reaching the national final in its third campaign before claiming its first CIS banner last winter. The Carabins defeated archrival McGill in three games in the 2014 best-of-three RSEQ final, which concluded yesterday. The Martlets are the most decorated program at this week’s championship with three CIS titles. Laurier has one, while Moncton, Saskatchewan and St. Thomas are looking for their first trophy. NOTES: A complete championship preview will follow on Tuesday... A meet-the-teams media conference is scheduled for noon AT on Wednesday at the Grant Harvey Centre... The CIS major award winners and all-Canadians will be announced at a banquet Wednesday night. * The webcast of the championship final will be on pay-per-view basis.